Rather than risk defeat, Mayor Tory puts brakes on contracting out garbage. Staff report on the issue gets sent back for more study. 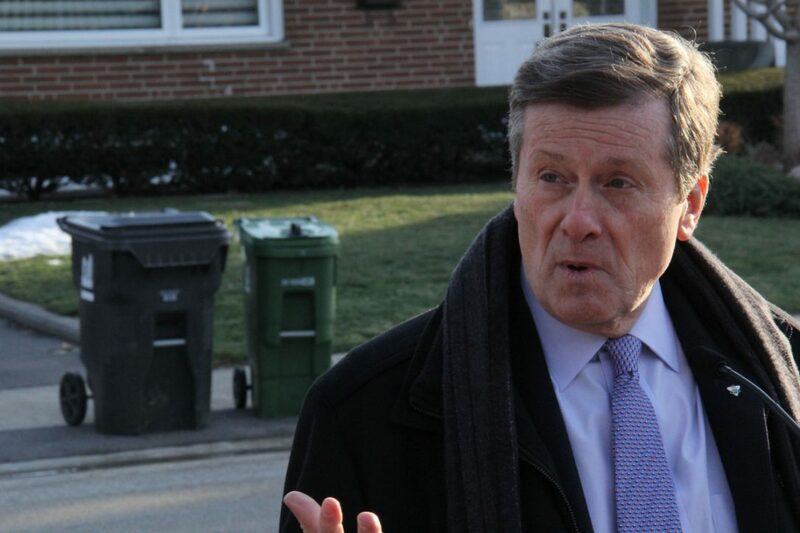 Facing the potential defeat of his plan to expand private trash collection, Mayor John Tory has retreated from his 2014 campaign promise and instead now says more facts are needed on an issue that has deeply divided council. Critics of the plan to outsource trash collection east of Yonge St. said the mayor wasn’t able to rally the support he needed. That could have led to his biggest defeat yet on the floor of the 45-member council. On Tuesday, just as the debate was getting underway, Tory tabled a surprise motion to refer back to city staff their report calling for the Scarborough garbage collection contract to be put out to tender. It passed 40-4. “We voted almost unanimously today to go and get more facts that were missing from the discussion,” Tory told reporters after the vote. Dozens of CUPE Local 416 members who had filled much of the city council gallery raised their arms in victory, shook hands and hugged after the vote. Tory’s about face came after vigorous lobbying by anti-privatization forces, including CUPE Local 416, which ran a public relations campaign called Kicked to the Curb. But the mayor and his allies also pushed their cause. Earlier this month, Tory appeared for a photo op with an Etobicoke family as they put out the trash, an attempt to underscore the cost-saving benefit of private garbage collection in the west-end, where it has existed since 1995. But that was before a public works committee meeting drew attention to the fact that it actually cost less, per household, for municipal employees to pick up Scarborough’s trash than in Etobicoke. The Toronto Environmental Alliance also released a report showing waste diversion rates are lower west of Yonge Street served by private collectors, than in Scarborough. TEA called on city staff to release more information so council could make an informed, evidence-based decision. Tory’s motion keeps Scarborough collection in the hands of city workers in CUPE Local 416 for now, with a request for a staff “review of options for future waste collection service” at some point in the future. Tory said he doesn’t control the timing of the next garbage report. But relieved privatization opponents on council don’t expect to see the issue surface again before next year’s municipal election.